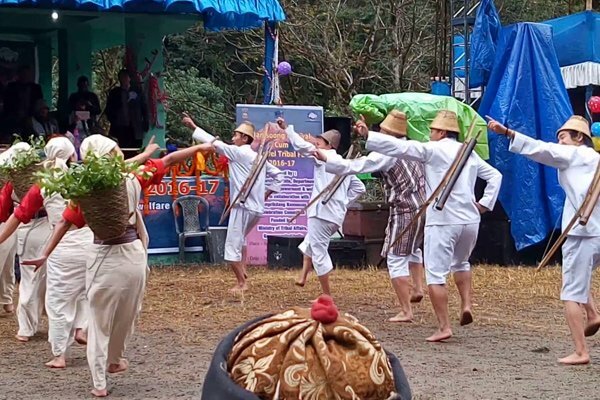 One of the gradually taking up cultural fests of Sikkim, Namprikdang Namsoong is celebrated every year at the confluence of rivers Teesta and Tholung Chu in Upper Dzongu region of Northern part of the state. The festival marks the new year of the Lepcha Tribe and provides for a magnificent visual treat of folk dances, traditional games and exotic Sikkimese (Lepcha) cuisine. For cultural aficionados, anthropologists, historians and the offbeat travellers, this festive time by far makes for a perfect season to plan their trips to Sikkim. The celebrations for Namsoong first commenced in the year 1976 on the Namprikdang ground, a small and grassy flatland in the Dzongu valley that is believed to connect the mythical abode (called Mayal Lang Country) of Lepcha ancestors. Surrounded by thick forests and majestic hills on all sides, the Lepchas believe that all good people from their community who pass through this life, navigate through this nature’s beautiful cradle to finally reach their heavenly abode. Besides, a number of other interesting Lepcha legends and stories are also associated with Namprikdang, which makes it a marvel not only for the locals but, also for historians and researchers who travel here to specially get an insight into actual facts of these folk tales. And nevertheless, Naprikdang Namsoong simply provides them a perfect platform to carry on with their research work simultaneously experiencing the Lepcha’s unmatched cultural feast and hospitality. The festival is held for 15 days during December-January timeframe every year on the Namprikdang Ground next to the confluence of Rivers Teesta and Rangeet. The main venue for the celebrations is the beautiful traditional Lepcha house that commemorates the resting place of their ancestors. Traditional Lepcha dances, make shift restaurants and food stalls serving authentic Lepcha cuisine provide for a fascinating time to all the locals and travellers who completely immerse themselves in the festive spirits. Namprikdang Namsoong Festival provides for a lifetime opportunity to travellers, historians and anthropologists gain a profound insight into ancient Lepcha cultural beliefs and faiths. Shamans (priests) on the day of the celebrations perform various religious rituals offering prayers to Mt. Kanchenjunga and Lepcha ancestors that provide for an unmatched hypnotic spectacle, instantly taking all the tourists in awe of their unique cultural legacy. Besides, traditional folk dances and an elaborate spread of authentic Lepcha cuisine mainly comprising of roasted pork, beef and Chhang certainly keep the foodies busy.